Rainfall across most of central and southern Queensland this summer has been significantly below average. 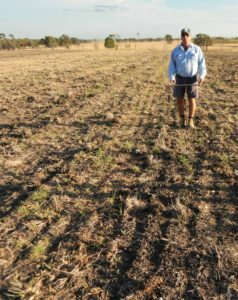 Even under dry conditions such as these, research and commercial experience demonstrates that successful pasture establishment can occur if soil moisture is stored prior to sowing. To demonstrate this, Laurie Peake at Wandoan is hosting a trial investigating the impact of varied amounts of stored soil moisture (via different fallow lengths) on the establishment and early growth of a new grass-legume pasture. This trial began in late February 2018 when Laurie, with the support of staff from the Department of Agriculture and Fisheries sown pasture team, pegged out 9 plots (12 m wide x 100 m long) to be fallowed for four different lengths of time. The fallow lengths were long (10 months), medium (5 months), short (2 months), and no fallow (soil disturbed only at planting time). ‘Fallow’ is a cropping term used to describe when a paddock is cultivated, or sprayed out with herbicide, to kill plants and allow rainfall to be stored ready for the next crop. Generally, the longer a paddock is fallowed for the greater the chance of rainfall and therefore the more moisture stored in the soil. Despite below average rainfall in 2018 (Laurie received 450 mm) the longer the plots were fallowed for, the more moisture stored in the soil at sowing in December 2018 (more soil moisture meant the push probe could be inserted deeper into the ground (Photo 1 and 2)). Photo 1: Medium 5 month fallow plot where probe was able to be pushed into the soil approx. 50 cm. Photo 2: No fallow plot, where probe was unable to be pushed into the soil. Laurie planted Gayndah buffel grass, Progardes desmanthus and Caatinga stylo at the end of December 2018 ahead of forecast rain. The season leading up to sowing was challenging for this trial and the summer continued to be dry after sowing until mid-March 2019 when 75 mm and 35 mm of rain fell in two events. This rainfall has resulted in germination of the seed planted in December, almost 3 months earlier (Photo 3). Photo 3: New desmanthus and buffel plants germinating after rain in March 2019. 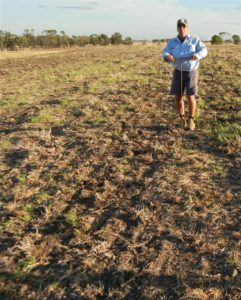 Storing soil moisture prior to sowing a new pasture is a good insurance policy. 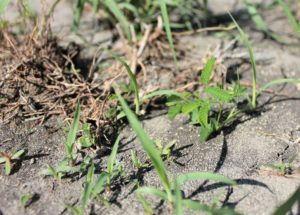 Stored soil moisture mitigates against establishment failure by increasing the length of time pasture seedlings can survive from germinating rain until more rain is required. In a year like this, stored soil moisture can be the difference between successful pasture establishment and failure. While fallowing comes at a cost (the paddock cannot be used for grazing for some months, and costs are incurred to kill the existing pasture), the cost of a failed pasture establishment due to no stored soil moisture is significantly higher when re-seeding costs are considered. Our aim is to keep FutureBeef readers updated with the results from Laurie’s trial so tune into the next edition of the eBulletin (due to be published in May 2019) to find out how the pasture in the different fallow lengths perform. A research and extension project jointly funded by the Queensland Department of Agriculture and Fisheries and Meat and Livestock Australia is delivering a suite of research trials and on-farm demonstrations, workshops and web materials about legume best management practice for the Brigalow Belt bio-region in Queensland. Click here to find out more information about the project. Written by Louise Newman and Stuart Buck, Department of Agriculture and Fisheries.